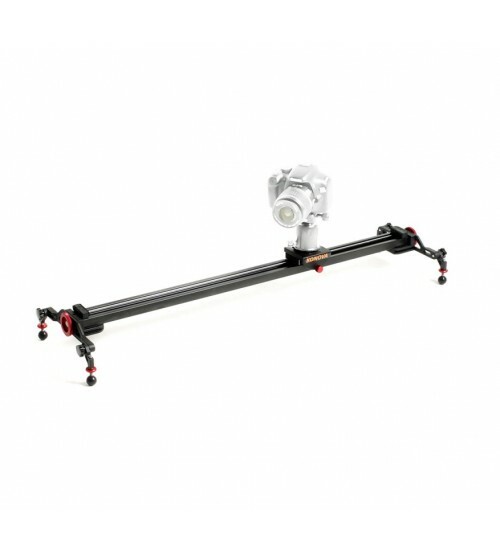 The 47.2" long Konova K5 Slider supports loads up to 50.7 lb and features roller bearings that provide smooth, stable, and quiet operation. Compared to the K2 and K3 sliders, the K5 Slider features larger bearings and larger 8mm chrome-plated rails, contributing to its increased load capacity while maintaining smooth slides. The slider can be supported using a single tripod or a pair of tripods/stands thanks to 1/4"-20 threads located on the underside of the track, positioned along the center and at either end. Additionally, there are threaded holes on the sides of the slider that enable you to mount it vertically. For ground-level shooting, a pair of height and angle-adjustable legs with rubber ball feet are included that screw into the sides of the slider. The slider carriage features a 3/8"-16 screw for attaching a fluid head or ball head. The resistance of the carriage can be dialed to taste quickly using a red friction adjustment knob, or with more finesse using a wrench to adjust tension. A metric ruler running the length of the slider makes it easy to perform precise and repeatable camera movements. Should you wish to expand the system in the future, you can choose to add an optional crank handle kit or one of the motion controller options.